From now on I would be using this space (neependra.net) for non-tech and personal blogs. All the tech, meetup etc blogs would now go to my company’s blog. In Bangalore we celebrated Docker’s 4th Birthday at Microsoft Office on 25th March’17. Over 300 participants signed up and around 100 turned up for the event. We had around 15 mentors. We started the event at 9:30 AM. After a quick round to introduction with Mentors, participants started doing the Docker Birthday Labs. Docker community and team have done a great job in creating self explanatory labs with Play with Docker environment. Most of the participants followed the instructions on their own and where ever needed, mentors helped the participants. 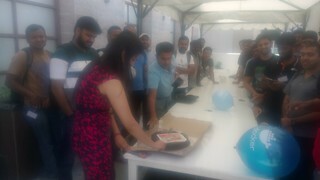 Around 11:30 AM our host Sudhir gave a quick demo Azure Container Service and then we did the cake cutting. This time only one girl attended the meetup event, so we requested her to cut the cake. After that we had light snacks and spent time in networking. It was great event and I am sure participants would have learnt something new. Thanks to Usha and Sudhir from Microsoft for hosting the event. In the next meetup we collaborating with 7th other meetup of Bangalore and doing a event on Microservices and Serverless. If you are following the updates here then you would know that in Feb’17 AWS, DevOp and Docker meetup group of Bangalore did a combined event in the following proposed community driven event format. This is going to be one great event as we have already received good amount of talk proposals and are looking for more until 7th April. If you are interested then please submit your talk proposal here. And if you would like to attend the event then go respective meetup group and purchase the INR 100 ticket. 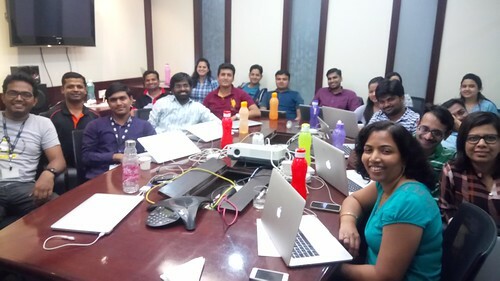 Last weekend we had 4th Kubernetes Meetup in Bangalore at VMware’s office. More than 100 people signed and ~40 people showed up. The first session was from Akshay Mathur and Manu Dilip Shah of A10 Networks who shared their experience on choosing and using Kubernetes for their product. The next session was from Krishna Kumar and Dhilip Kumar from Huawei who talked about managing stateful application with Kubernetes. Krishna first gave us good overview and then Dhilip showed us a demo. He also urged participant to join Kubernetes Stateful SIG. The last talk was from Magesh and Kumar Gaurav of VMware on using using k8s to orchestrate VMware SaaS. It was an interesting talk on which Magesh talk about some real problems his team has faced. Some participants asked about comparing Docker Swarm, Kubernetes, Mesos Marathon and other container orchestration. We had brief discussion about I share my last year’s LinuxCon/ContainerCon EU workshop on comparing different container orchestrators. We also talked about on what we should do in in the next Kubernetes meetup. We might do hands-on labs. In the end I also shared the details about the community event we are doing in conjunction with other meetup groups like one we did few weeks back AWS, DevOps and Docker meetup groups. In April we plan to do similar event on Microservices and Serverless. Other than previous participants Kubernetes and Mesos & CNCF meetup group would also be joining it. It was a good meetup. Thanks for the organisers and speakers. Continuing our experiment with community driven conference, this time AWS,DevOps and Docker meetup collaborated to do a combined meetup. We charged INR 100 to each participants to make sure they are really interested in coming. From the collected money we gave gifts to speakers and some prized to the participants. 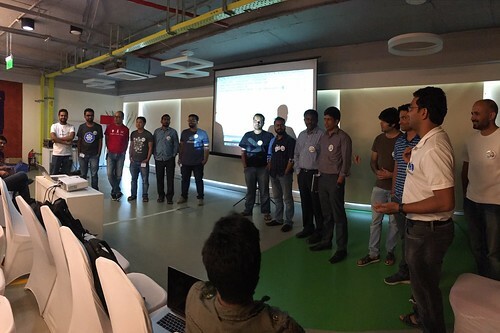 The meetup was hosted at Bangalore’s LinkedIn office. It was really nice venue and and everything went as expected. Out of 150 participants ~140 showed up, which is really nice. Some people came from Chennai and Cochin as well. So putting a nominal fee really works :). We started almost on time. The first talk was from Neeraj Shah from Minjar Cloud. He shared his experience on how he deployed application on ECS. He mentioned the advantages of using ECS to deploy Docker based application on Cloud and why one should use it. Next talk was on from Mohit Sethi, who talked about managing storage in containerised environments. Sreenivas Makam then talked about Docker 1.13 experimental features. He briefly introduced us with new features of Docker 1.13 and then focussed on experimental feature. Experimental features can enabled from stable binary only, which is a real help for anyone who wants to try out upcoming Docker features. In the end we also good discussion about Docker Stack. We took a quick break after that and had quick intro session with all the organisers. After the break Madan shared some great tips on saving cost with AWS. After that Shamasis shared Postman’s scaling journey with Docker and AWS Beanstalk. It was really fascinating. In the first Flash talk Gourav Shah open-sourced a project on creating Devops workspaces using Docker. Generally one is required to have more than one machined to try DevOps tools like Chef, Puppet Ansible etc. With this tool one can build a multi-node setup using Docker and do different labs. The last session was from Mitesh, who showed to use Jenkins and CodeDeploy to deploy the applications on AWS. All of the sessions were very informative, venue was host, participants were eager to learn. I think it was really good meetup. Thanks to all the speakers and our host Bathri and Sethil at LinkedIn. Thanks to organisers for AWS and DevOps meetup group specially Mohit and Habeeb. We did our first meetup for 2017 at GO-Jek’s engineering office in Bangalore. ~400 people rsvped and ~120 people came for the meetup. This is first time we tried to live-stream and record the videos. Though we could not record all the videos due to out lack of experience but still we got two complete ones, which I think is a good start. This first session was from Nishant Totla of Docker. He talked about Docker Swarm and Swarmkit. The next session was from Saifi Khan who talked about Docker on Windows. He had no slides but demos. Somehow he had an issue with the display driver so we could not see the demo but even without any slides and demo, he engaged the audience with nicely and had very interactive Q & A session. After Saifi, Thomas Chacko talked about Serverless Computing and Docker. He have very informative overview with some demos. Next was Kiran Mova form OpenEBS, who talked about Emerging storage technologies for containers. Lastly I gave a demo on Jenkin’s Docker Plugin and how we can the Jenkins pipeline to build CI/CD environment. Within the community we were discussing about the community driven mini-conference/larger meetup for some time, which I documented here. Lets see if we can take it forward or not. I also shared the details about the MOOC on container technologies which my company is launching on 14th Jan’17. The first course would be on Containers Fundamentals. You can find more details here. We plan to live-stream and record future meetups. Hope to do better next time. Time for Community Driven Conference/Larger Meetup ? You name the technology and you would find active meetup in Bangalore. Be it Docker, DevOps, AWS, GlusterFS, Machine Learning etc. Every meetup group meets at-least once in every two months and share the knowledge. These days cloud, be it public or private seems to common platform for everyone and containers are slowly becoming unit of execution. There are few conferences which are dedicated on these topics which bring people together. This idea is on similar lines but the quest is whether can we do a conference which driven by the community ? Who would provide the venue ? What if we announce the conference, sell few tickets but don’t have enough fund to pull it off ? What if we don’t find the sponsors ? We’ll open-up 200 registration in the beginning and then ask people to pay 200 per ticket. 200 registrations because that is what we can accommodate in a meetup, if event does not happen. We are charging some money to make sure participant is really interested. Once 200 people are signed up we can go to companies for sponsoring the venue. The company can pay us or directly to the venue/event management. If we don’t get the sponsorship then we’ll just to a meetup as usual. Whatever money we collected so far, we can give that back in prizes during the meetup. Sounds good ?? This is just a concept now. Lets see if we can take it forward in next week or so. Do leave your comments if you suggestions/idea ? Docker organised Global Mentor Week around the world between 14-19th Nov’16. In Bangalore we scheduled it on 19th Nov at Microsoft office. We divided the group into two groups Beginner and Intermediate of 125 each. Out of which ~60 turned up for each session. The content for the mentor week was shared by the Docker, which had hands-on exercises for basic and intermediate level. Microsoft provided Azure pass for every participant so that we all can have same working environment. But during the workshop we faced some internet issue, so everyone could not hands-on on that day. But with Azure pass and labs, participants can try out the hands-on later. For the beginner level we had four mentors Sreenivas Makam, Bathrinath Raveendran, Ratheesh T M and myself. Sreenivas did the heavy lifting by walking through the Docker basics and labs. He also shared the notes to try out Docker Mentor Week’s lab on Azure. We had the beginner session between ~9:40 AM to 12:145 PM. After the lunch we did the intermediate training. As the internet was not working, we decided to share the concept of Container Orchestration in general and then with Docker Swarm we showcased a sample application. I used the content from my LinuxCon/ContainerCon workshop which I did last month in Berlin. After that Ajeet showed how to prepare Docker Swarm cluster on Azure and run & scale the sample application. Both sessions were very interactive. I hope more people would have joined from the confirmed list. I had to say no to few group members as they could not get the confirmed ticket. Thanks to Pracheta, Usha, Surubhi and Sudhir form Microsoft for helping us with the Venue and Azure Passes. LinuxCon, ContainerCon 2016 in Berlin was very special for me, as this is the first time I represented my company CloudYuga as a speaker in an international conference. The event was scheduled between 4th to 7th Oct.’16 . I reached there on 3rd Oct’16 and got a chance to meet Jim Zemlin Executive Director of The Linux Foundation. On 4th, during the keynote Solomon Hykes, Founder and CTO of Docker open-sourced Infrakit, which is a toolkit for creating and managing declarative, self-healing infrastructure. It is currently used in Docker for AWS and other similar solution. Later in the day I attended sessions on Comparing Container Orchestration tools by fellow Docker Captain Adrian Mouat, Cgroups session by Michael Kerrisk and Mircoservices vs Reverse-Proxy via Emile Vague. In the evening I attended the speaker and sponsor’s party at House of Weekend, Berlin. On 5th I spent most of the time preparing for container orchestration workshop on 7th. Though I attended few sessions like Getting started with Mesos Marathon by Brenden Matthews, OCI session by Qiang Huang, Docker Orchestration via Aaron Lehmann, Phil Estes talk on container security and Migrating traditional & existing app on container by Scott McCarty. In the evening I attended 25th Anniversary of Linux Celebration The Great Orangery at Charlottenburg Palace. There I got the chance to meet Dan Kohn, Executive Director of The Cloud Native Computing Foundation and discussed about the course I did for Linux Foundation, earlier this year. After that we had Docker Captain’s party at some nearby restaurant. On 7th I delivered the hands-on session on container orchestration, in which I covered Docker Swarm, Kubernetes and Mesos Marathon. For Docker Swarm and Marathon I gave instances on DigitalOcean to each participant. For Kubernetes I created a cluster on Google Cloud and had a namespace created for each participant. I heard some good feedback about the workshop after the session was over. After the session I went to attend Docker Distributed Summit for rest of the day. The summit had very good technical content. All of the videos are recorded and would be shared soon. I could not attend the second day of Summit as I had come back on 8th. As always this had been a great experience. Learned a lot, met many interesting people and made some new friends. People have been asking me who is funding your foreign trips as I attended DevConf in Brno,CZ and DockerCon in Seattle earlier this year as well. I have been funding my own trips, which I think as investments. I got few leads from this conference as well. Hope I am in right path by doing so. Let’s see if I would have another blog post for overseas conference or not.